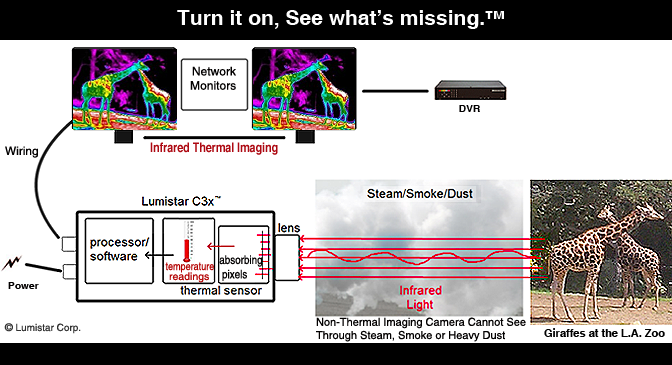 Thermal cameras 'see' or measure heat with their sensors. Energy from infrared light begins by hitting the lens of the camera. The lens then focuses these light particles to absorbing pixels on a thermal sensor. Each pixel on the sensor derives an individual temperature read. Those pixels are individually processed via hardware/software. The processor compacts each individual temperature read together, at a fast refresh rate, images and then motion video are created. The term "infrared" refers to a broad range of frequencies, beginning at the top end of those frequencies used for communication (fiber optics), and extending down to the lower frequency of the spectrum until you reach visible red. The wavelength frequency range is from about 1 millimeter down to 750 nanometers. The range adjacent to the visible light spectrum is called the NIR or "near-infrared" (night vision goggles), the middle frequency "mid-infrared" (thermal imaging), and the longer wavelength part is called "far-infrared" (deep space telescopes). English physicist Sir Isaac Newton lectured on optics between 1670-1672. During this period he discovered that a prism could decompose white light into a spectrum of colors. In 1777, Italian researcher Marsillo Landriani discovered that each color of visible light had a corresponding increase in temperature up to red. Prior to 1800, the existence of the electromagnetic spectrum above the visible color spectrum was unknown. 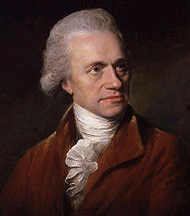 In 1800, Sir William Herschel, Royal Astronomer to King George III of England, had the idea that the temperature intensity might continue beyond the color red. Herschel repeated Landriani's experiment using a thermometer bulb painted black with ink and a glass prism coupled with plane and curved mirrors. He proceeded to measure the temperature in the dark space beyond the color red. To his surprise the temperature continued to increase. Herschel sometimes referred to these wavelengths beyond the visible portion of red as 'the invisible rays'. The first person to refer to them as infrared was 75 years later and is unknown. In 1829 the thermocouple was invented by one of Napoleon's artillerymen, Leopaldo Nobili and Italian physicist Macedonio Melloni. In 1830, Melloni was the first to accomplish advancing Herschel's work by using a prism made of polished rock salt crystal (NaCI), eliminating the need for mirrors. Unlike glass prisms, rock salt is transparent to the infrared spectrum much like Lumistar advanced lens material today. Melloni used this new technology and had a breakthrough by connecting a chain of thermocouples together creating a super thermometer or properly named a 'thermopile,' 40 times the sensitively of best contemporary thermometers of his day. Using it to detect the infrared spectrum, it could measure the heat of a person 3 meters away. Melloni's discovery was the first thermopile infrared (IR) detector and his discovery of polished rock salt crystal remained the primary optical material for the next hundred years. In 1840, 14 years after the first photograph was taken in 1826, as photography was advancing, a similar process was used to take the first 'heat picture' by famous astronomer Sir John Herschel, Sir William Herschel's son. He called this first image on paper, created with a thin film of petroleum as his capture agent, a 'thermograph'. In 1878, American astronomer Samuel P. Langley invented the bolometer: "A device for measuring the power of incident electromagnetic radiation via the heating of a material with a temperature-dependent electrical resistance." Using a strip of platinum, covered with lampblack between two strips of Wheatstone creating a Wheatstone bridge circuit, he connected the circuit to a galvanometer corresponding to the intensity of heat. By 1880, Langley's bolometer was refined enough to detect thermal radiation from a cow a quarter of a mile away or 400 meters. He also discovered new atomic and molecular absorption lines in infrared. Sir James Dewar Invented the use of liquefied gasses as cooling agents such as liquid nitrogen. In 1892, he also invented a vacuum insulating container (which today's modern thermos derives its technology) to store these liquefied gasses as cooling agents. This technology became the basis for cooling bolometers in the early days of thermal imaging and in today's long-range detection. In the years between 1900-1920 infrared came into the popular conscious of mainstream scientists and inventors. These early inventions were primarily used by the military to detect personnel, artillery, aircraft, ships, and icebergs. In 1905 Albert Einstein develops the theory of the photoelectric effect, finding the particle of light that is absorbed by pixels in future thermal sensors nearly a century later. During WWI infrared devices were used for enemy detection systems including aircraft, remote temperature sensing, communications (the light in fiber-optic networks today is infrared), and even 'flying torpedo' guidance also known as "heat-seekers". Both sides of the war had access to these technologies and used them against each other. Detection devices were able to detect airplanes at .94 miles (1.5 km) away, or a person more than 984 feet (300 meters) away. Infrared detection at this time was primarily used like motion detectors are used today. Infrared/Thermal imaging was yet to be invented. During the period between WWI and WWII 'near-infrared' imaging detectors were invented. In 1929, Hungarian physicist Kálmán Tihanyi invented the first infrared-sensitive (night vision) electronic television camera for anti-aircraft defense in Britain (he also designed the world's first automatic pilotless aircraft). The various militaries classified it as secret due to it allowing them to "see in the dark". The sensitivity for imaging wasn't that great and was limited to near-infrared, the area of the electromagnetic spectrum closest to red, also known as the nonthermal part of the infrared spectrum. To achieve this near-infrared, infrared 'search beams' had to be used to illuminate the subject/target which gave away the soldier's position. This technology is also referred to as 'active' infrared. This post WWI technology later evolved into today's active infrared night vision goggles (in contrast to modern starlight-type night vision devices which generally only magnify ambient light). The thermal imaging camera, using the 'mid to far-infrared' wavelengths, was originally developed for military use during the Korean War. Secret military infrared research programs were set up after WWII between 1945 and 1955 by the United States Defense Department to develop 'passive' infrared (no illuminating search beam) using only particles of infrared light via Einstein's discovery. The secrecy around thermal imaging was lifted in the mid 1950s. The first conventional thermal camera, the "Evaporograph", was declassified around 1956. Most thermal imaging cameras today use the 'mid-infrared' spectrum, while astronomy telescope cameras use the 'far-infrared' to see distant targets light-years away. 'Near-infrared' is not thermal. In the late 1970s, today's current thermal sensors were developed by the U.S. Department of Defense. These sensors lack the need for cooling except for long-range which can see over 10 miles. The U.S. Government declassified this non-coolant technology in 1992. Today, Lumistar Camera has been free to develop further advances for civilian and military use, under strict government regulation.